"Part of United" print on the back, it's kind of funny. 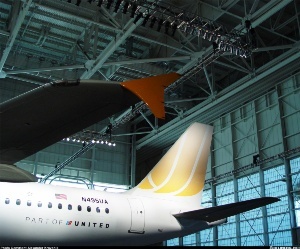 "I am also wondering if the tail on the new United livery will be similar or different to this one?" Could this possibly be truth, or just mere speculation? Sorry, but how do I insert a picture, thanks! I thought the TED thing was a joke. HAHAHA, Well I guess the joke was on you, then! No, seriously though it's all real, here's Uni"Teds" Site. Wait, I am confused now! I thought it was real, but it is a joke? Do you think they'll rename the mainline side Uni? What's this I hear about a promotion where at some airports guys in "Ted" shirts randomly pay for people's lunch and say "this one's on Ted"?? I want free food! Yeah, but no in-flight meals? I'd be all "Hey Ted, I appreciate lunch, but why don't you wait until I'm sitting in a middle seat between DEN and MCO to buy my lunch, buddy!" [/ QUOTE ]Homophobes?! What could possibly motivate you to say that? The "LCC" carriers do wacky stuff to make you think they're 'low price' as a marketing ploy! Well geez, I should apologize for blowing their cover. In my opinion, the only airline that ever operated as a true low-cost operator and did a damn good job of it was Western Pacific.